The group meets every 3rd Monday monthly at 7:45pm in The Greenwood Community Centre, High Street, Green Street Green. Yes. You will need to book and pay in advance. This is because all flowers and materials are provided. No. 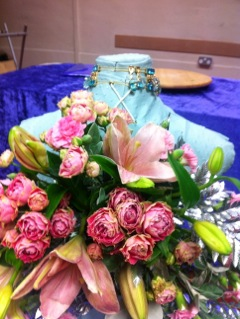 Workshops will suit complete beginners as well as more experienced flower arrangers. No. There is no annual membership fee or commitment to come every month. However, please book in advance. Bring yourself. Bring a friend or come alone and make friends. You will need to bring floristry scissors or knife. If you don’t have floristry scissors, bring secateurs and scissors (not your best dressmaking scissors). You don’t need anything else. Everything will be provided – flowers, foliage floral foam, accessories etc. Costs will vary but are likely to be £7 - £15. Great value for a full evening out AND everything included. For further information and to book to attend a workshop meeting phone Jane: 07939 532 914.